After all the heavy lifting, moving boxes, power tools, video equipment … not to mention building workbenches and work tables and painting we all need a bit of fun! 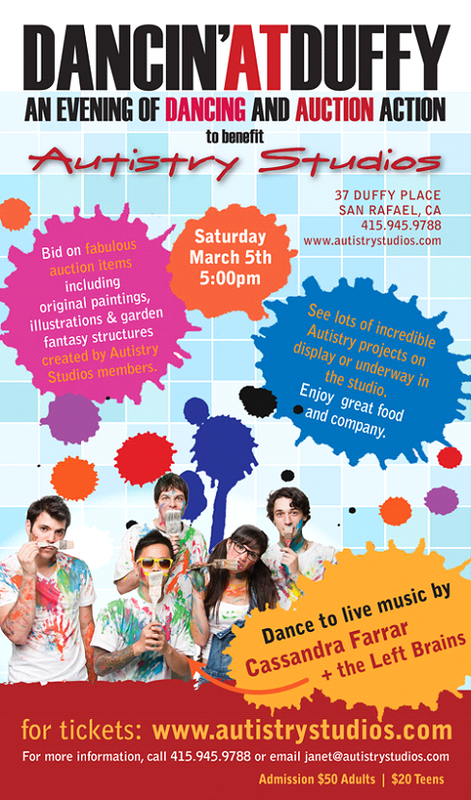 So, join us as we kick up our heels at our first Autistry Studios fundraiser for Duffy Place. The warehouse is a great venue for a party – lots of room to dance. And, yes, that is a photo of the band! There will be great auction items all created by Autistry students – garden fantasy structures, paintings, books – and much more. Fabulous food from LaVier Fusion Cuisine! Tickets are available online at: http://www.brownpapertickets.com/event/153082. $50 for adults, $20 for teens. 2011 is off to a great start! Thanks to Autistry families and friends we met the $7,500 Miranda Lux grant challenge. 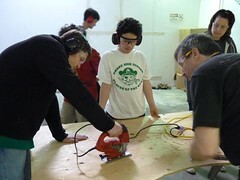 These funds are specifically to support our Core Pre-Vocational Workshops and will be used to purchase power tools, video equipment, and workshop supplies. It will also augment our Opportunity Fund making it possible for more families to attend our workshops. 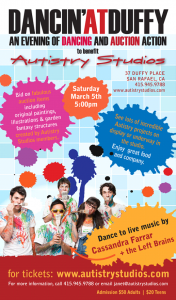 DANCIN’ AT DUFFY PLACE – Saturday, March 5, at 5pm. Mark your calendars for our first big event in the new studio – 37 Duffy Place, San Rafael. The warehouse studio will be transformed into a dance hall and art gallery as we celebrate our wonderful new space and expanding program. There will be a live auction of Fantasy Garden Structures specially created by the Autistry members, a silent auction of fabulous student artwork and music by Cassandra Farrar and the Left Brains. Join us for an evening of fun and creative exuberance. Tickets go on sale soon so stay tuned. Friday Build Stuff with Dan: Adam finished building his dual boot computer and is now converting an old laptop into a digital photo display unit. He is fast becoming our go-to IT guy. Corey is working with Dan on the Fantasy Garden Structures -researching photos and helping with the design concepts. Ian G. is doing the very detailed painting of his characters for the new diorama. 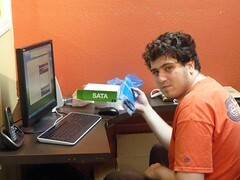 He is also working with us during the week on a host of Autistry building chores. Ross has finished the sketch model for his World War I piece and will begin the build process. We welcomed a new member, Daniel M. to the group this week. Daniel has been exploring Star Wars scenes looking for the perfect scenario to build. Saturday Film Stuff with Nate: Peter and Steven added the credits to the Rock ’em Sock ’em epic. It will have its premiere showing at the March 5th event. This semester Ian and Sawyer will work with Peter and Steven to create a group project. I peeked in and it looks like there is a film noir in the works! Lots of venetian blinds and deep shadows. Saturday Build Stuff with Dan: The train boys! Connor, Ryan, Andrew and Daniel G. are working together on a huge HO scale train layout. This is an exciting and ambitious project based on a layout done by John Olson and featured in Model Railroader. This week they cut out the road bed for the tracks. Everyone got a lot of practice on the jigsaw. Sunday Build Stuff with Dan: Lots of energy in the Sunday group! David is carving a bokken (wooden Japanese sword). Daniel S. is making fiberglass chest and back armor. As none of us has done this before we will all be learning something new. Devon is adding the final touches to Rattina’s Nest. 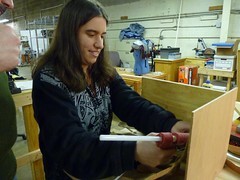 Gabe, who just joined us is building a multi-level dreamscape diorama. Tuesday Build Stuff with Dan: Owen is working with Suzi to get Eunice the Unicorn ready for the printers. Abe finished his tug boat and is working on a wooden castle with a drawbridge. He also has a new line of Valentine Cards for sale. Katharine finished the base of her Beetlejuice diorama and will begin work on the house and cemetery. April came on board with lots of ideas and energy! She is working on an undersea diorama – a real challenge. Thursday Build Stuff with Dan: Two new faces on Thursday. Jon is working on a retro Batmobile as well as creating some great character sketches. Aaron is in the exploration phase, looking through books for ideas and letting his mind go wide and dream. Rinny has created some wonderful characters for her shadow play and has shot several test scenes. 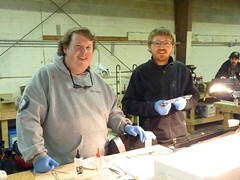 Erik, pictured here with Jonathan, is putting the finishing touches on his Sausalito train layout – it is looking great! Jonathan, after suffering through putting together a teeny tiny model is now working on the Titanic. Lots of work happening around here and we are having a blast. Great project idea. Minecraft Lego and other Lego.